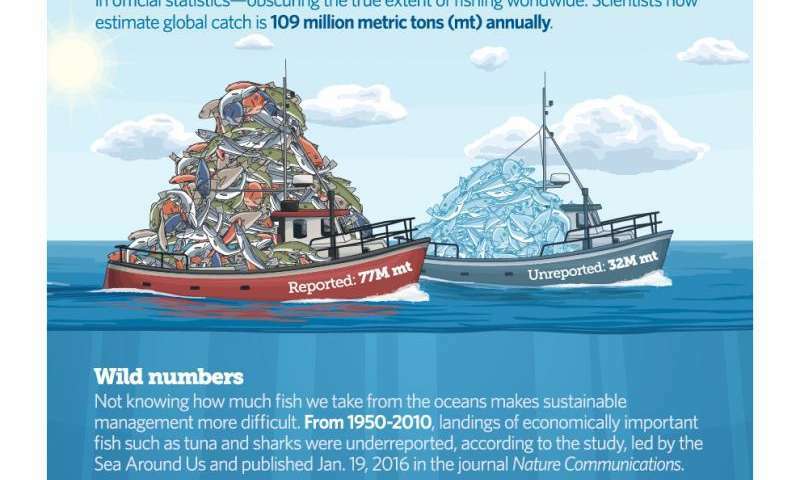 The new estimate, released today in Nature Communications, puts the annual global catch at roughly 109 million metric tons, about 30 per cent higher than the 77 million officially reported in 2010 by more than 200 countries and territories. This means that 32 million metric tons of fish goes unreported every year, more than the weight of the entire population of the United States. Researchers led by the Sea Around Us, a research initiative at the University of British Columbia supported by The Pew Charitable Trusts, and Vulcan Inc., attribute the discrepancy to the fact that most countries focus their data collection efforts on industrial fishing and largely exclude difficult-to-track categories such as artisanal, subsistence, and illegal fishing, as well as discarded fish. "The world is withdrawing from a joint bank account of fish without knowing what has been withdrawn or the remaining balance," said UBC professor Daniel Pauly, a lead author of the study and principal investigator of the Sea Around Us. "Better estimating the amount we're taking out can help ensure there is enough fish to sustain us in the future." Accurate catch information is critical for helping fisheries officials and managers understand the health of fish populations and inform fishing policies such as catch quotas and seasonal or area restrictions. For the Nature Communications study, Pauly, his co-author Dirk Zeller, and hundreds of their colleagues around the world reviewed catch and related data from more than 200 countries and territories. Using a method called catch reconstruction, they compared official data submitted to the UN Food and Agriculture Organization (FAO) with estimates obtained from a broad range of sources, including academic literature, industrial fishing statistics, local fisheries experts, fisheries law enforcement, human population, and other records such as documentation of fish catch by tourists. "This groundbreaking study confirms that we are taking far more fish from our oceans than the official data suggest," said Joshua S. Reichert, executive vice president and head of environment initiatives for Pew. "It's no longer acceptable to mark down artisanal, subsistence, or bycatch catch data as a zero in the official record books. 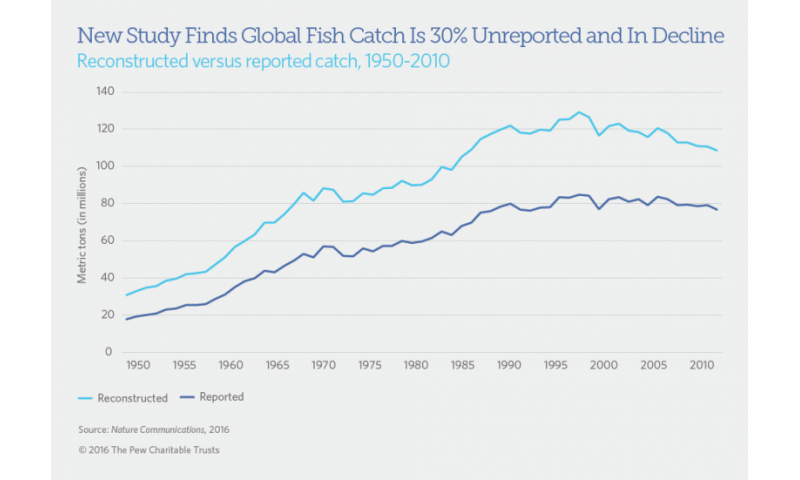 "These new estimates provide countries with more accurate assessments of catch levels than we have ever had," said Reichert, "along with a far more nuanced portrait of the amount of fish that are being removed from the world's oceans each year." "Data are integral to maintaining global fisheries," said Raechel Waters, senior program officer for ocean health for Vulcan Inc. "Without an accurate understanding of fish catch, we risk underreporting or misreporting, which can handicap countries in their efforts to implement effective fisheries policy and management measures. "This is particularly important for countries that do not have the resources to conduct comprehensive fishery assessments," said Waters. Surprised the survivalists aren't hoarding tins of tuna for their predicted coming dystopia. 50 years from now it will probably be worth more than gold. More and more the American business model is taken for par. "Throw a dose of fraud into any business activity. Get idiots to work against their own interests and gut enforcement by shouting about esoteric constitutional principles".